Effects, risks and side effects . . . Whether a drug has a therapeutic effect or is a poison depends on its dosage. It is the task of the industrial pharmacy to develop and manufacture an appropriate dosage form, i.e. a formulation, which delivers the drug substance in the right quantity and quality at the right time to the right site in the body showing an optimal drug bioavailability (see fig.1). Fig. 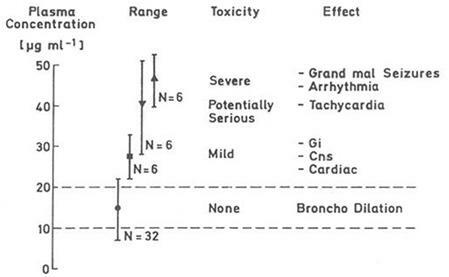 1: Plasma concentrations of the drug theophylline are related directly to the therapeutic effect (Bronchodilatation) and appearance of adverse reactions. Thus, the dosage form (tablet formulation etc.) needs to be designed that the drug concentrations is confined within the therapeutic window, i.e. above the minimum effective (10 μg ml-1) and below the toxic (20 μg ml-1) drug concentration showing an optimal bioavailability. From a drug substance to a therapy . . . 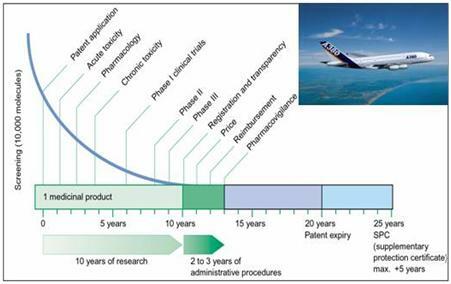 The task to transform a promising drug substance into a safe therapeutical product is very complex and comparable to the development of an aircraft, which has to deliver safely passengers at the right time to the right destination (see fig.2). Fig. 2: The path of a drug substance to become a safe medicinal product is full of hurdles. Only one out of 10 000 is successful after years of testing (courtesy Dr. J.Werani, Pfizer). Scale-up: identical quality for small, medium and large size batches. In case of combination drugs with more than one active substance, e.g. in order to improve patient compliance the task to develop such a complex formulation becomes a real challenge (see Nature Reviews Drug Discovery, 5 November 2006,881-882 : Simon Frantz The trouble with making combination drugs) and needs special attention, which can be only resolved by using computer-aided techniques like in the aircraft industry. The costs for a new medication on the market are much too high. The time to market is much too long. Unfortunately despite the lengthy R&D process, the quality of the final product could be much better. This fact prompted FDA's and EMEA's Process Analytical Technology (PAT) and Quality by Design (QbD) Initiative. At the same time there is a Lack of Innovations concerning new therapeutic entities, new excipients, new drug carriers and new process technologies. These conclusions have lead to the foundation of the Institute For Innovation in Industrial Pharmacy, IFIIP GmbH, and the Center for Innovation in Computer-Aided Pharmaceutics, CINCAP GmbH c/o IFIIP GmbH. Both Institutions are looking for remedies to shorten time to market, to improve the quality and to reduce simultaneously R&D costs using advanced computer-aided techniques in formulation and process technology research similar to the aircraft industry and looking for advanced materials as new drug carriers, new excipients and exploring new process technologies etc. These above goals can be realized thanks to the existing expertise of IFIIP and CINCAP and thanks to the international networking activities.